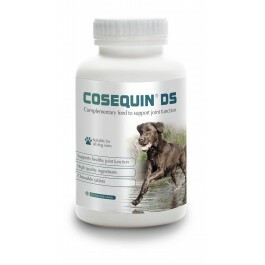 Cosequin is a joint health supplement that slows the breakdown of cartilage to maintain joint health and ease of movement. 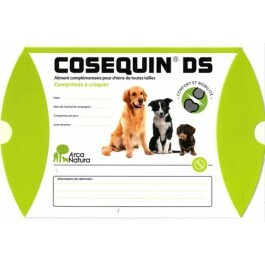 COSEQUIN DS protects dog's joints by reducing cartilage breakdown and stimulating it to produce compounds that keep it healthy. Bottle of 90 chewable tablets Cosequin DS has a 4 year shelf life from the date of manufacture. Once open replace the lid and store in a cool dry area. Stored correctly Cosequin DS will last until the Best Before End date even if it has been opened. Licensed by Bioiberica. Manufactured for Bioiberica S.A Pza. Francesc Macià 7, 08029 Barcelona, Spain (ESP08300315) by ESP08300455. 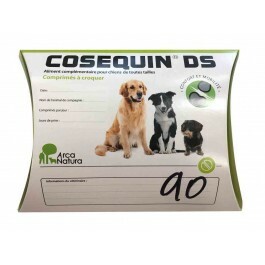 Cosequin®, FCHG49® and TRH122® trademarks and Cosequin® manufacturing rights are licensed to Bioiberica, S.A. from Nutramax Laboratories, Inc. Used with permission. All rights reserved.